I ordered this set for my grandson's room. I already had a room in my home decorated in a western style, so his cherry crib accented with this well-made bedding set was a perfect fit. 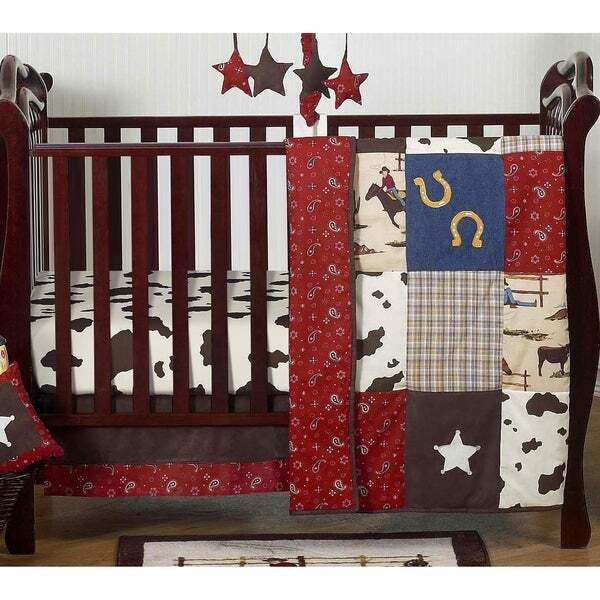 Wild West Cowboy 4 Piece Crib Bedding Set has all that your little bundle of joy will need. Let the little one in your home settle down to sleep in this incredible nursery set. This western themed baby boy crib bedding set combines Sweet Jojo Designs exclusive cowboy print, cow print, red bandanna print, plaid, denim and microsuede in a patchwork construction. The detailed embroidered horseshoes and sheriff stars finish the look perfectly. This set uses the stylish colors of Red, Chocolate Brown, Camel, Blue and Gold. The design uses 100% cotton fabrics combined with microsuede fabrics that are machine washable for easy care. This wonderful set will fit most standard cribs and toddler beds. Crib set includes: Crib Comforter, Fitted Sheet, Crib Skirt (Dust Ruffle), Diaper Stacker.